Cool roofs have been around since the ’80s and should ring a bell. You may have seen pictures of the Department of Energy’s white rooftop in Washington, D.C. or read about New York City Mayor Michael Bloomberg and former Vice President Al Gore’s 2009 partnership to develop cool roofs on over 10,000 square feet of rooftops in Queens. Secretary of Energy Dr. Steven Chu has been promoting cool roof coatings for years and the EPA’s Energy Star program has been rating cool paints and coatings since 1999. Even Wal-Mart has applied the white, energy-saving roof coating to over 4,500 of their stores nationwide. But what exactly constitutes a cool roof and how does a layer of paint save energy? A cool roof is any type of roof that is covered in a white or reflective coating or paint. Traditional dark-colored roofs use tar, gravel, asphalt or wood shingles to absorb solar radiation—heat from the sun. The problem is, because the heat is absorbed by the roof, it is transferred below into the interior living space, drastically heating up the air inside. This temperature spike leads to an increased demand for air conditioning and, in turn, a higher demand for peak-hour electricity and the associated elevated energy costs. Roofs treated with a cool roof coating reflect the solar radiation and mitigate the heat transfer into the living space, significantly reducing both the surface temperature of the roof and the interior living space. The financial savings of a cool roof vary from building to building, but on average, a cool roof coating can cut air conditioning costs up to 50 percent, depending on the height of the building. For example, Wiig estimates that one-story homeowners who use their air conditioning on a daily basis can reduce their energy costs by at least 15 percent if they install a cool roof. For businesses and homeowners that do not have an air conditioning system, Wiig admits that they won’t be saving any money, but said that they will benefit from cooler indoor temperatures. Although the financial and practical benefits of installing a cool roof are compelling, many people, especially homeowners, have reservations because they find white roofs aesthetically unappealing. Dark colored roofs and shingles have become so popular that many people cannot fathom an alternative. In fact, roof color plays such a big role in curb appeal that many contractors and builders employ colorists or color consultants to assist with the visual aesthetics of the home. This trend is especially evident on the Ewa Plain where almost all of the new house have different colored roofs, walls, windows, borders and doors. Commercial businesses, however, have been less picky about the color of their roofs and more open to the idea of painting them a lighter shade. McCallum said he has put down cool roofs on dozens of schools, malls, churches and businesses. The Neal Blaisdell Center, the physical education athletic complex at the University of Hawaii at Manoa, and the new Target in Hilo have either a white or reflective roof coating, too. 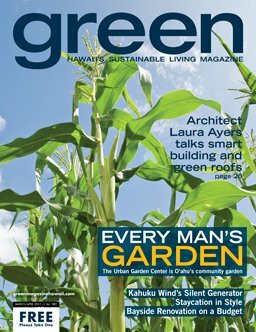 Supporters of cool roofs are optimistic about the future of cool roofs becoming the norm in Hawaii. “It’s all about changing the paradigm that our culture relies on,” says Wiig. In 1995, less than 10 percent of homes on Oahu had air conditioning. Today, that number has jumped to over 50 percent. Couple that with the ever increasing cost of electricity and the $1,500 tax credit that homeowners can receive if they use Energy Star rated reflective roof products and there’s little reason why one shouldn’t opt for a cool roof.